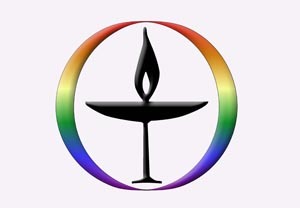 Our church, like other Unitarian Universalist churches, is governed under the “congregational polity” model, meaning our members make ultimate decisions including the adoption of church bylaws, the election of the Board of Trustees, the adoption of a church budget, and the call of a minister. Our church is organized as a Missouri non-profit corporation under Chapter 355 of the Missouri Statutes. Our basic governing documents are our Corporate Charter and Bylaws. The Board of Trustees adopts Board Policies to flesh out the details of church management. An Annual Congregational Meeting is held in April, May or June each year to hear reports from the president, the minister and staff members, review the past year’s financial report, elect new members to the Board of Trustees, adopt the budget for the next fiscal year starting July 1, and conduct any other business specified in the notice of the meeting. In the past, a Leadership Council reporting to the board supervised many church committees and activities, and certain staff members reported directly to the board. In 2010-11, the Board of Trustees created a Governance Task Force to review and recommend changes to the church’s organizational structure. The new structure, called “policy governance,” is depicted below. It assigns a policy-making and resource-providing role to the board and designates the minister as “chief of staff” – that is, supervisor of staff members and volunteers. The minister also performs traditional pastoral duties. The graphic below fleshes out the organizational structure and shows the lines of communication. 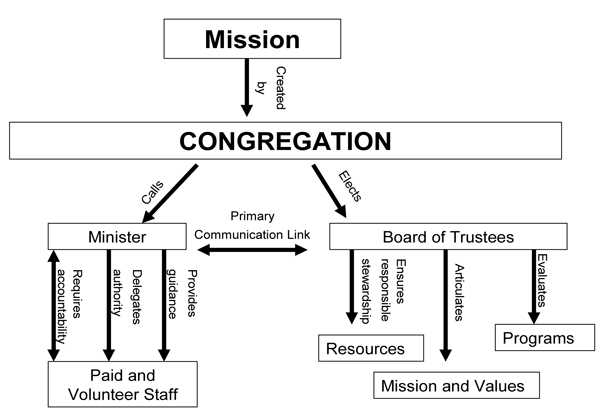 Note that the Safer Congregation Committee shown in the middle of the chart is a “hybrid” body that serves and reports both to the minister and the board. The board is responsible for exercising ultimate control of the church’s human and material resources to ensure that the church serves its mission. The central role of the board is to effectuate the church’s mission as discerned and articulated by the members. Related roles are making choices about goals and strategies and deciding who will be responsible for implementing them. The board delegates power to those who direct the daily work, holding them accountable for their performance. 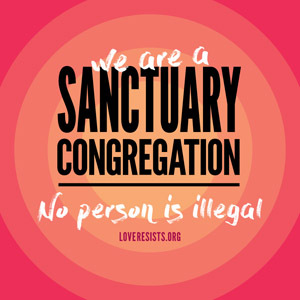 The board is ultimately responsible for seeing that the congregation’s money, property and people are kept safe, and that the congregation lives in harmony with its own values. The board primarily accomplishes these responsibilities by producing minutes, policies, ends statements, and strategic-planning documents. The Minister is responsible not only for traditional pastoral duties but also for the entire ministry of the church, which is most of the rest of what the congregation does. It involves making daily choices about money, time and space. The Minister supervises staff and volunteers in the active, “doing” aspects of the congregation. This means supervising all those who participate in the day-to-day activities of the church, whether directly or through staff members or volunteer coordinators who report to the Minister. Teams and ministries supervised by the Minister are largely self-directed and composed of people who have the interest and skills to carry out the particular ministries. Among other things, ministry brings into being worship services, religious education classes, study groups, social action projects, mission trips, service projects, well maintained facilities, happy children and adults, and renewed hope. Ministry requires written job descriptions, setting goals, and conducting evaluations.